For relish: Char bell peppers over gas flame or under broiler until blackened on all sides. Enclose in paper bag 10 minutes. Peel and seed peppers; cut into 1/2-inch pieces. Set aside. For salmon: Preheat oven to 400°F. Mix 1/4 cup mayonnaise with 2 Tablespoons of your favorite hot mustard and brush salmon all over with mixture. Top with panko seasoned with salt and pepper. Heat an iron skillet, place the salmon skin side down and sear just enough to crisp up the skin. Flip the fish over and then place the skillet in the preheated oven. Roast salmon until opaque in center, about 10 minutes. Transfer to platter. 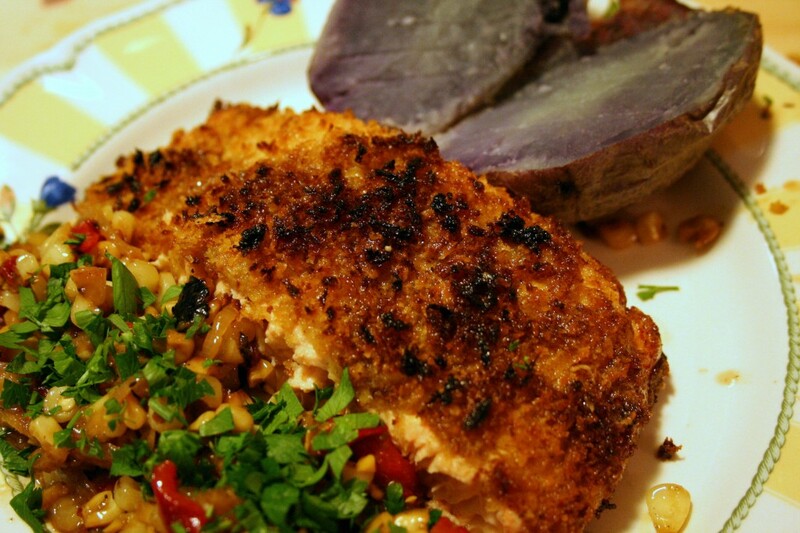 Spoon relish over salmon and serve with baked purple potatoes.